Kiva's partners deal with the day-to-day issues involved with microfinancing and the full financing is done as a team effort - you can lend in as little as $25 USD per entrepreneur or group and other Kiva members pitch in the rest. 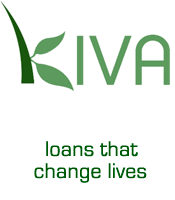 Please be aware that Kiva provides INTEREST-FREE LOANS - you are not giving your money to these entrepreneurs. While there are always potential extenuating circumstances, our experience with Kiva's entrepreneurs has been very positive - we have had no defaulted loans in the 6 months we have been lending and several paid back in full.